As many of you all might know, I was chosen to represent Albania at the Blog it Home conference in Washingon DC! Over 350 bloggers entered into the contest and it was narrowed down to eight winning blogs over several rounds of deliberation. My blog was chosen because my blog represents a good example of Peace Corps goal 3, which is “to help promote a better understanding of other peoples on the part of Americans”. During my week in DC, I will be giving cross-cultural presentations about Albania to youth and professionals back home. In order to represent Albania the best, I have been talking with my coworkers, friends, and neighbors to get a better, more well-rounded perspective. I could still use your help though! I know that I have many Albanian readers and below I have listed several questions that I feel your perspective would help give my presentation that extra oomph. Please feel free to answer any of the questions or none at all. 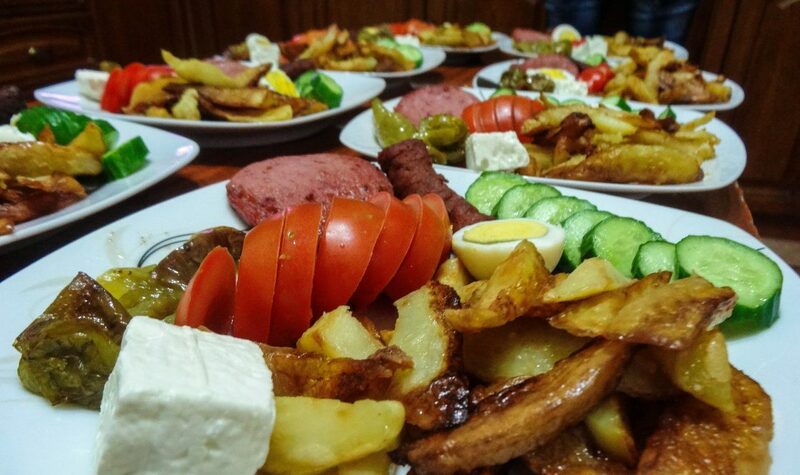 If you could tell Americans anything about Albania, what would it be? What are you most proud of about Albania? What would you like to see change in Albania in the next 10 years? How has Albania changed in the past 10 years? Do you have any traditional clothes, artifacts, dolls, games, etc that I could borrow as presentation aids? I would return them promptly upon my return back in Albania. Anything else you’d like to mention about Albanian culture, language, best places to visit, etc? Thanks so much for your help and I sincerely appreciate any feedback you have for me! I can’t wait to represent Albania and share a piece of this special place. This summer I have managed to stay extremely busy, which has been drastically different from my experiences during my first summer in country. All that intentional relationship building (IRBing) and networking has finally begun to pay off! I have been working on several different projects this summer, but my main project (and definitely the biggest and most time consuming project) was planning and coordinating the national Outdoor Ambassadors summer camp for 80 participants across the country. This camp required months and months (nine months to be exact) of planning and careful preparation. Sometimes throughout the process I wanted to bang my head against the wall because of the random obstacles that would arise or because of the sheer amount of time it required, but in the end all the tears, sweat, and hard work I put in ended up paying off with an amazing camp! I couldn’t have coordinated this awesome event without the help of the rest of the Outdoor Ambassadors committee, especially our treasurer Luke who created the budget, my shadow Kelsey who was my right-hand woman and emotional support, our president Masha who helped keep me on track with all the details, and the materials coordinator Quinn who documented the entire camp and created all the media surrounding the event. The camp also wouldn’t have run properly without the help of the amazing Peace Corps volunteers and Albanian counselors who helped run activities and games, plan informative group lessons, and give camp the energy and pizzazz needed to sustain a week full of fun! This project has been my greatest success as a volunteer thus far and it felt good to implement something on such a large scale. Since it was such an accomplishment I wrote this “success story” for our Peace Corps Albania Facebook page which goes more in depth about the project. Please check out the Outdoor Ambassadors Facebook page and our website (which is currently under construction) for more information about our cause and to view more photos from the event! 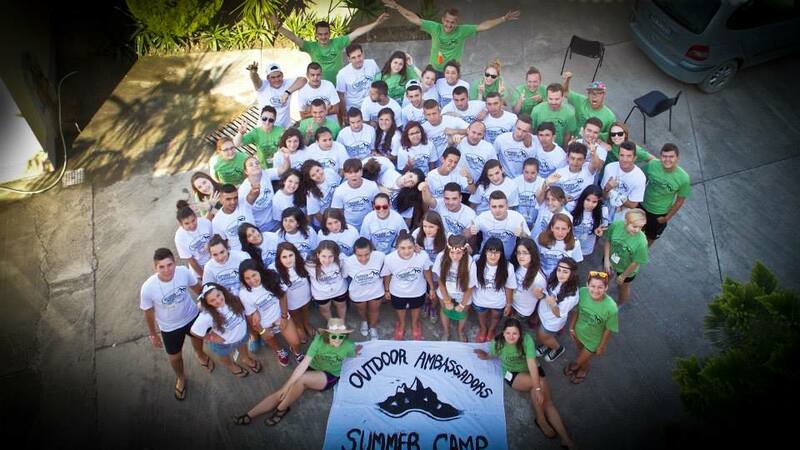 On August 15-19, 2014, the American Albanian Development Foundation (AADF) in collaboration with Outdoor Ambassadors and Peace Corps volunteers held a five-day environmental leadership summer camp in Ishull Lezhe. Sixty students from fourteen communities across the country participated (Bajram Curri, Burrel, Corovode, Fier, Kavaje, Kucove, Leskovik, Lezhe, Librazhd, Pogradec, Prrenjas, Saranda, Shkoder, and Vlore). 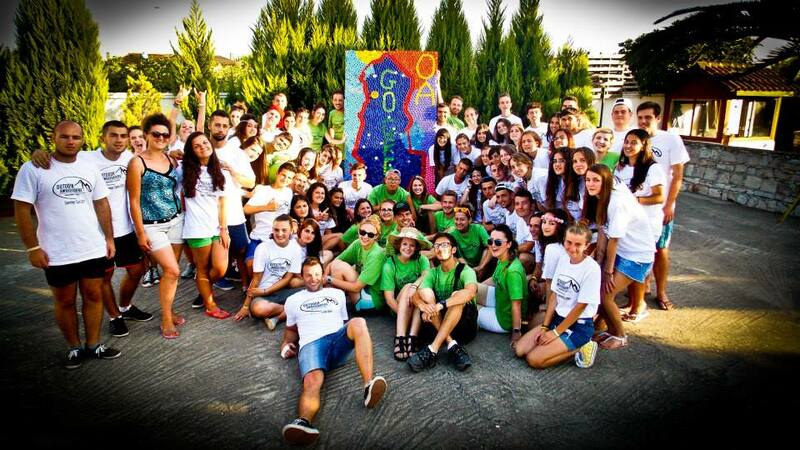 The summer camp focused on fostering leadership skills amongst the youth in Albania. At this years camp, the theme was “Go Green” and throughout the week campers were asked various “go green” trivia questions to check their knowledge about different ways that they can reduce, reuse, and recycle in Albania. 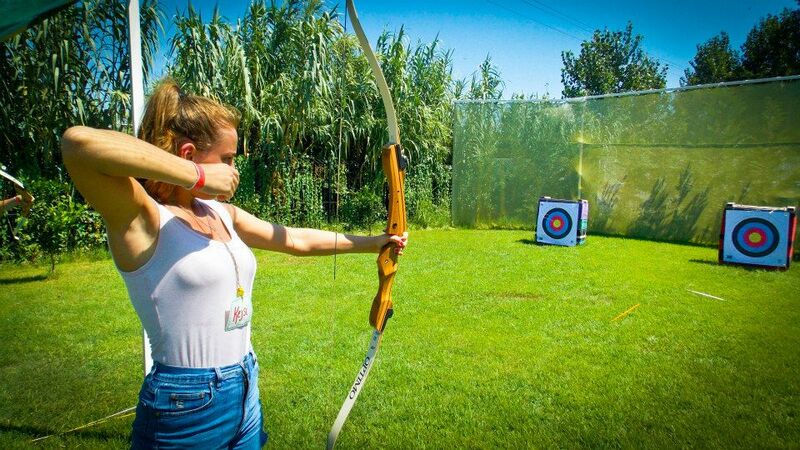 Campers engaged in activities such as archery, rock climbing, song-writing, swimming, yoga, and more, all while developing a sense of environmental consciousness and leadership skills. Prior to camp, each Outdoor Ambassadors’ group raised 5000 lek (fifty dollars) or more in their communities to help fund the camp. To raise money some clubs held local summer day camps for children, while other clubs held community events to raise money and awareness for the event. The clubs raised over $800 total locally in their communities! Along with raising money, the clubs collected over twenty kilograms of bottle caps for the camp community project. Many clubs helped pick up bottle caps from the local beaches, while others reached out to businesses to ask for help with the cause. The camp was high-energy and full of activities throughout the week. Each day the students had the opportunity to swim, rock climb, and participate in archery and yoga​ . The campers were divided into eight groups and rotated through activities with their groups. The groups playfully competed against each other during the week through different activities, challenges, and with the go green trivia. The arrival day consisted of ice-breakers and group games led by Albanian counselors and Peace Corps volunteers. There was also a brief Training of Trainers for the staff that had not participated in the camp setting as a counselor before. ​Along with these activities, groups also competed against each other in relay races. The first activity day of camp, campers participated in song-writing lessons, recycled arts and crafts, an ecosystems lesson, soccer, a self-esteem and meditation lesson, and an amazing group scavenger hunt in which students had to work together as a team. For the scavenger hunt each team used compass and navigation skills to find group challenges in different areas around the camp. The campers especially enjoyed the song-writing activity because they were able to take popular songs and rewrite the lyrics with an environmental “go green” element. On the second activity day campers went on an excursion to the Lezhe castle. At the castle, the students helped clean up inside and around the castle through a garbage pickup. Along with the excursion, campers learned about gender, first aid and emergency help, and how to leave no trace when camping and hiking in the wilderness. They also played volleyball and had time in the billiards room. That evening the camp was lit up with flair from all the campers during the talent show. Some campers performed skits, others sang and belly danced, and each group preformed their environmental group song from the song-writing lesson the previous day. On the final activity day, campers participated in a lesson about stigma and a lesson about fire safety. They also raced through the camp adventure playgroup challenge course complete with a zip-line and other fun obstacles. The campers created a bottle-cap mural for the community project. The bottle caps that were collected before camp were used to create a unique recycled art project. The caps were arranged on a large wooden plank in the shape of Albania with special markers in each of the Outdoor Ambassadors cities that participated in the camp. After the project was complete, the campers gave the final cap project to the community of Lezhe and all of the extra bottle caps were donated to the Albanian Cap Project to help provide wheelchairs to people in need. The night ended with special awards and certificates, as well as a camp dance and bonfire. Many participants declared that this was one of the best weeks of their lives and that they would never forget all the lasting memories and new friendships that developed over the course of the week. 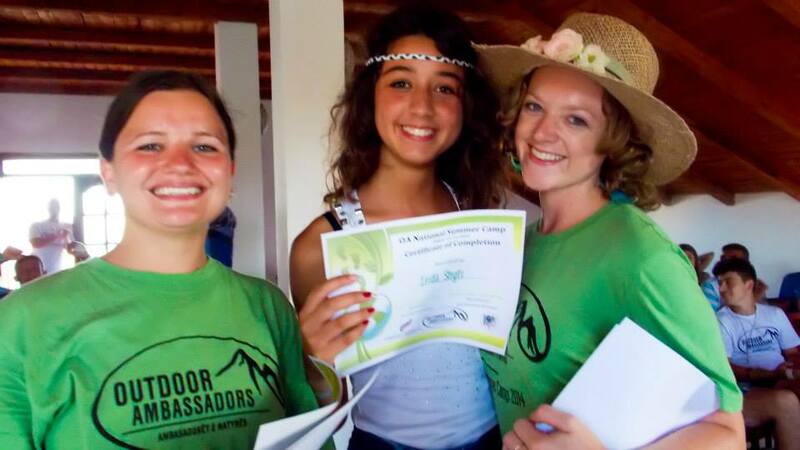 Now students, Albanian counselors, and Peace Corps volunteers are equipped with the energy and excitement to continue Outdoor Ambassadors events in their communities throughout the school year! Big thanks to AADF for all the support! Watch the above video and check out the reasons why Outdoor Ambassadors “Go Green” Summer Camp was one of the best weeks EVER! Cooling off by the pool. Learning to aim at archery. 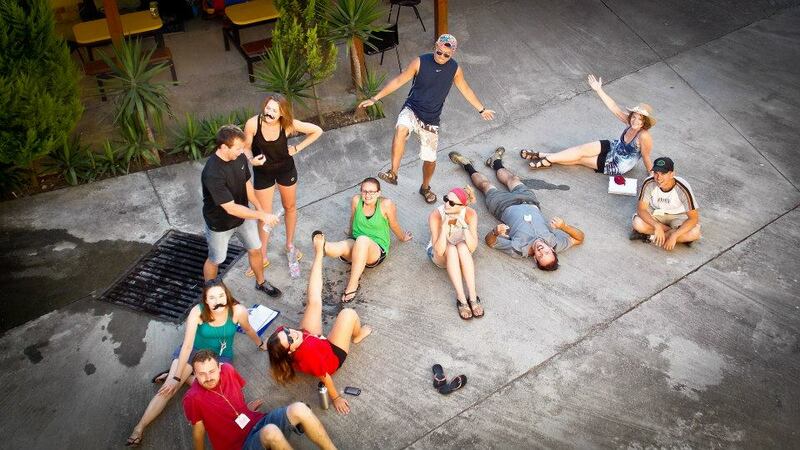 The Peace Corps volunteers taking time to be silly. 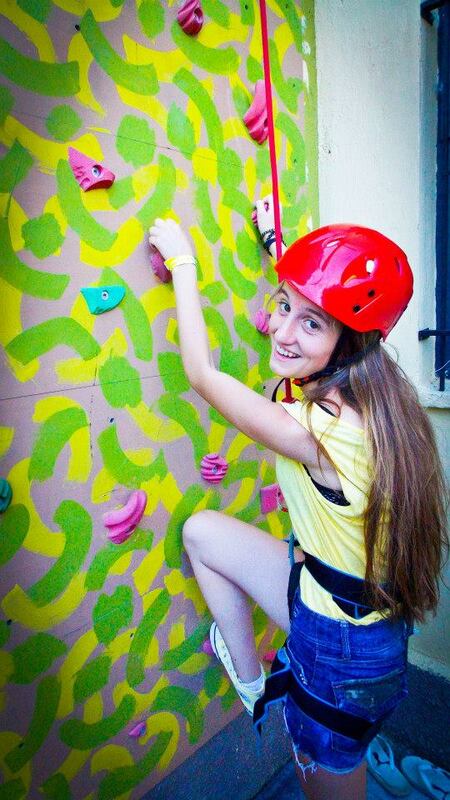 One of the students on the rock wall. At the garbage cleanup excursion at the castle. Ice breakers and team building activities. The president and I giving awards to one of my students from the Outdoor Ambassadors group in my city. Our beautiful bottle cap mural and community project. There has been a lot of controversy regarding this challenge. Many people are refusing to donate because they believe the ALS Association is using embryonic stem cell research in their studies. Using embryonic stem cells is often thought of my pro-life activists as taking away one life to help save another. Other arguments towards the challenge include the waste of clean drinking water (although let me just be clear the water used in my ice bucket challenge was not potable), the waste of water in general because many people across the world do not have consistent access to water, and the idea of “slacktivism” which allows people to feel like they are helping a cause without actually having to do anything. While there is a lot of controversy and some negative opinions surrounding these techniques, in reality this marketing campaign has been a huge success. Over 50 million dollars have been raised to help further research to help find a cure for this debilitating disease and awareness about Lou Gehrig’s Disease has obviously increased tremendously. Whether or not all the Ice Bucket Challenge participants actually donate money is not the point, although it is awesome when people participate in the challenge AND donate money. The point is that people are getting excited about the idea of philanthropy and being a part of something bigger to help the overall quality of mankind. I am in complete support of this cause and even though everyone is not doing the challenge for the right reasons, it’s imperative to remember that there are still many people who are learning and donating because of this. Plus it’s entertaining to watch everyone pour a bucket of water over their heads. Now the ALS Ice Bucket Challenge has made it all the way to Albania. Not only is the a viral phenomenon in the States, but it is making it’s way across the globe. It’s definitely not a surprise to me that this sensation hit Albania because, like I mentioned before, Albanians LOVE social media and Facebook. Several of my Outdoor Ambassadors youth group students nominated me for the challenge, so I definitely had to accept. I was very impressed that my students were involved in a campaign to help spread awareness and raise money for a disease that many people were probably unaware of before the challenge. As many of the haters would probably say, there are better ways to go about raising money and awareness for today’s problems, but in my opinion this is a great start to making philanthropy fun for the younger generations who are less likely to donate to charities. So go ahead, take the challenge, and donate to the ALS Association to help find a cure for Lou Gehrig’s Disease. Plus it honestly felt pretty good to escape the Albanian summer heat with a nice bucket of ice water over my head. Check out my video below and click here to donate. And while you’re at it, look up some other organizations that would be worth donating your time or money to. Let’s continue the culture of volunteerism and philanthropy! There are so many wonderful organizations and causes to get involved with! Click here to watch my Ice Bucket Challenge video. Recently a blogger reached out to me for a short piece to add to their blog showcasing different people from around the world. Check it out! This year marks the 2nd annual Peace Corps “Blog It Home” competition. More than 350 Peace Corps volunteers from 60 countries across the world submitted their blogs and now the competition has been narrowed down to 20 finalists. The finalists are Peace Corps volunteers from Albania (me! ), Cameroon, China, Dominican Republic, Ethiopia, Guinea, Lesotho, Madagascar, Paraguay, Peru, Senegal, South Africa, Thailand, The Gambia, Tonga, Uganda, and Zambia. I am the only finalist representing the Balkans and Europe! Starting yesterday (August 4th), Peace Corps posted a photo, blog description, and link to all the finalists blogs on the Peace Corps’ Facebook page. The public is now invited to vote aka “like” the blogs that they would like to see win the competition. Voting will run from August 4th -August 10th. The Peace Corps office will use all the votes/”likes” to decide which volunteers should win a trip to Washington D.C from September 14th – September 20th. Six winners will be chosen from the 20 finalists. In D.C, the winners will attend a conference regarding Peace Corps goal 3 and give a presentation about their host country to schools back in America. Please help me win this competition by voting for me on the Facebook page and sharing the photo with your friends on different social media networks. I would love to have the opportunity to share my love of Albania with people in my home country. It’s time to spread some knowledge about Shqiperia – the land of the eagle! Click this photo and “like” this photo on the Peace Corps Facebook page to vote for me!!! Pershendetje Miq. Disa prej jush mund ta dine se kohet e fundit jam perzgjedhur si nje prej finalisteve e “Beni nje Blog/shkrim ne Shtepi”, dhe kam mundesine qe te shkoj ne Washington DC te jap nje prezantim per Shqiperine e te ndjek nje Konference per Qellimin e Korpusit te Paqes 3. Ju lutem me ndihmoni ta fitoj kete konkurs duke visituar faqen e Peace Corps ne facebook dhe ta pelqeni kete foto! BENI “LIKE” DUKE KLIKUAR. Sa me shume pelqime/like merr kjo foto aq me shume mundesi ka qe Vullnetari te fitoje. Ju lutem me ndihmoni duke i bere like/pelqim dhe share/shperndarje kesaj fotoje ne menyre qe te mar sa me shume vota qe te jete e mundur. Ju falenderoj shume per te gjithe mbeshtetjen. When I chose to join the Peace Corps I knew my life would be completely different from my life in suburban Colorado working a 9-5 job, but I wasn’t really quite sure how. In Albania we have many of the same amenities that one would have in the states such as running water, electricity, grocery stores, and apartments. What is so different here is the lifestyle in general. There is a different mentality and a much slower pace of life. These changes can often be of the most difficult to adapt to because of the ideals instilled in me from such a young age. Things here (or anywhere for that matter) don’t always work the way they are expected to or they only work some of the time. Each day is different and stability is difficult to come by. There are many situations in Albania that test my patience, but today I realized how much my tolerance for uncomfortable, annoying situations has increased. One of the most erratic things in Albania is transportation. Volunteers here are lucky because we live in a relatively small country and there is transportation available, but even though transportation is usually available it isn’t always reliable. Bus schedules are non-existent or just plain wrong. 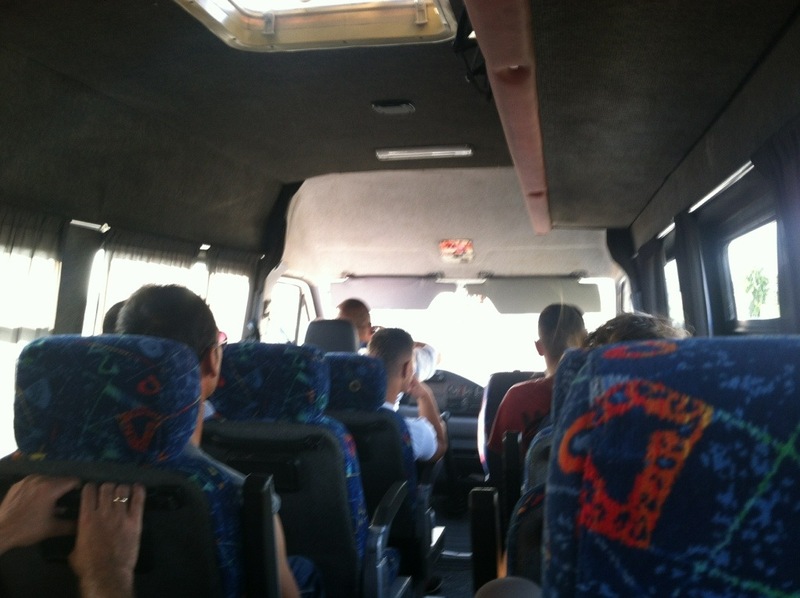 Since volunteers are not allowed to have private vehicles, we travel as the locals do – in public transportation. It’s always an adventure getting around here. While traveling back to site today, I arrived at the bus station (bus stations are only found in larger cities here, usually you just find transportation on the side of the road) to find that there are no more buses, even though the “schedule” indicated that the last bus left at 4:30pm. When I arrived at 3:45pm, alas – no buses were to be found. Luckily after waiting on the side of the road for a bit a furgon (small van) came tumbling down the road heading in the direction that I needed to get back home. During the ride home the furgon continually stopped on the side of the road trying to pick up each and every person melting in the summer heat. We made at least twenty stops within the first hour of the trip. No big deal though, this is the norm for traveling around here. 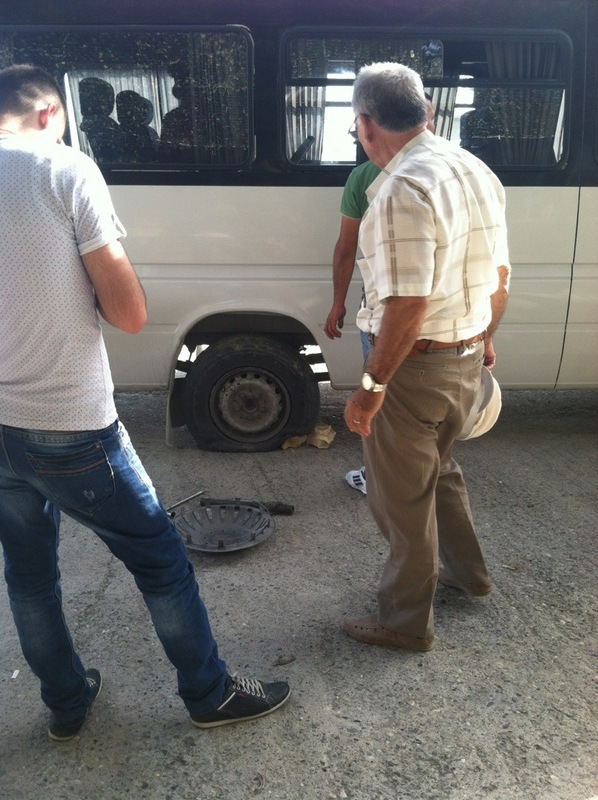 After a few more stops, the tire on our vehicle popped leaving me and fifteen other Albanians stranded on the side of the road in the middle of no where while a couple of the men tried to figure out the situation. Once the men all messed around with different things under the car they finally propped it up enough the change the tire. Of course the driver had a friend nearby who pulled up in a fast Mercedes with another tire to save the day. Yay, thanks random çun! The reason why this story is substantial is because it allowed me to step back and take a moment to reflect. Throughout the whole situation I was not upset or annoyed. I knew that eventually the tire would get fixed and that I would eventually end up back in the comfort of my home. If that took a few more hours than I originally anticipated, then so be it. Ska problem. There are always situations in life that test our patience and sometimes it is the simple little things that can be the most annoying to deal with. My time here just continues to help me grow as a young woman. I appreciate all the opportunities that I have to practice patience and compassion. Trying to fix the tire with rocks. Back in the furgon! The problem was fixed!